Demonstrators joined together on Capitol Hill for the March for Racial Justice on Saturday before walking to the Justice Department and National Mall. WASHINGTON — Thousands of demonstrators took to the streets of Washington on Saturday in a call for racial equality and justice. “This is about coming together in love and peace to ensure that people around the world know that Americans love one another,” said Maurice Cook, co-founder of the March for Racial Justice. 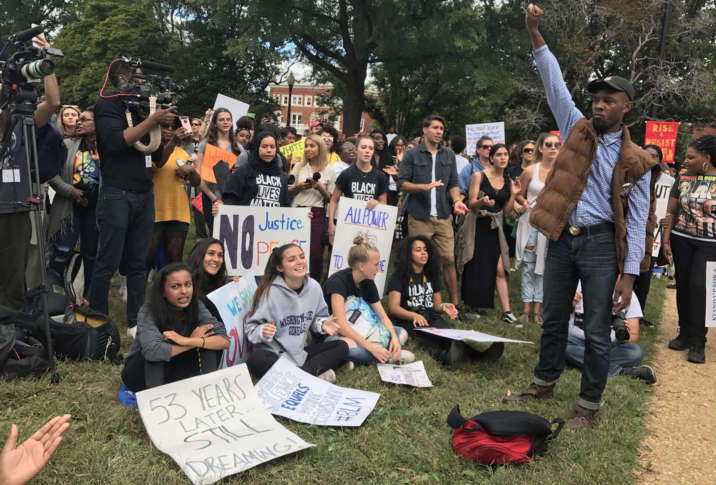 The large, multiracial crowd gathered at Lincoln Park on Capitol Hill, where they chanted and sang songs, listened to speeches and mingled in the breezy, sun-drenched autumn day. “We need to join together as a country — all races, all sexes, all religions — and realize that we are all Americans,” said Cheryl Kemp of Harpers Ferry, West Virginia. Joined by the March for Black Women, the crowds came together as they walked to the Justice Department and the National Mall. Demonstrators say they were motivated to rally by a resurgence of racial hate in the United States. Some carried signs with the names of black men shot to death in encounters with police. Supporters of Black Lives Matter and the anti-Trump group Resist also joined the march.